Butternut squash is a pear-shaped winter squash related to pumpkins, cucumbers and melons. This squash has a hard, yellow-tan skin and yellow orange to dark orange flesh. Boiled butternut squash has a subtle nutty and sweet flavor, and offers you a wealth of vitamins, minerals, riboflavin and iron, notes "Bon Appetit" magazine. You can eat boiled butternut squash as is or use it in soups, risotto dishes or pasta fillings. Select a butternut squash that feels hefty and has unbruised, matte skin. A glossy skin means that the squash wasn't allowed to ripen long enough, and it won't taste as sweet as mature butternut squash. Rinse and peel your butternut squash. The tough skin requires a high-quality potato peeler. If your peeler isn't up for the job, carefully slice off the skin with a sharp paring knife. Slice off the neck and stem with a chef's knife. Lay the squash on a cutting board and cut it lengthwise. Scoop out the seeds and stringy fibers with a spoon. Cut the squash into 1-inch chunks. Boil water in a pot. Carefully add the chunks of butternut squash, cover the pot with a lid and boil for 10 to 15 minutes. Your squash should be tender but still slightly firm. Remove the pot from your stove. 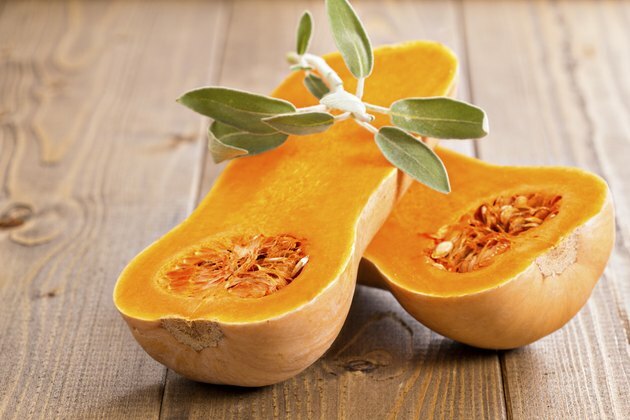 Carefully pour the butternut squash into a colander or strainer to drain off the excess water. Place the drained squash in a container and let it cool if you'll be using it in other dishes. You can also mash the squash and eat it like mashed potatoes. TheReluctantGourmet.com suggests spicing up boiled butternut squash with cinnamon, brown sugar, allspice or turmeric. Butternut squashes with thick necks and small bottoms usually have smaller seed cavities and more flesh. Do not overcook your squash or it will become mushy.